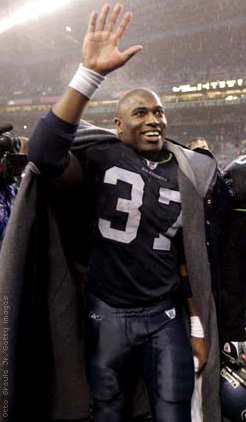 Although he doesn't have a championship ring, carrying the Seahawks to their first Super Bowl appearance (along with that touchdown record and NFL MVP award) made Shaun Alexander a lot sexier. He has become the shining star of the Seattle sports scene, the do-everything running back embraced by his team and fans. His million-dollar smile can be seen miles from the sidelines. Alexander is a downright Southern sweetheart. And the ladies (not to mention his beautiful wife and kids) love to see that sweet disposition -- a softer side that contrasts with his rugged style of play. Now, the Seahawks just need to sign their free-agent stud or there will be frowns everywhere in the Emerald City. VOTE FOR YOUR OVERALL FAVORITE MALE HOTTEST ATHLETE OF THE YEAR!